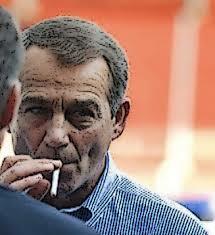 Apparently, Boehner was smoking like an old freight train in his office. Smoking is banned throughout the Capitol. Of course, laws are for the little people. WASHINGTON (Reuters) - Wisconsin Republican Paul Ryan can add one more burning issue to his agenda as the new speaker of the U.S. House of Representatives: how to get rid of the stench of cigarette smoke. Ryan said on Sunday he has been trying to come up with ways to remove the smell of cigarettes from the House speaker's office that he took over on Thursday after he replaced the retiring John Boehner, a heavy smoker. Asked if he is going to be able to get the smell of smoke out of the place, the fitness-conscious congressman said, "That's a really good question. And we've been talking about that." "They have these ozone machines, apparently, that you can detoxify the environment. But I'm going to have to work on the carpeting in here," Ryan told the NBC program "Meet the Press."